Essentialzymes-4 is a multi-spectrum enzyme complex specially formulated to aid the digestion of dietary fats, proteins, fiber, and carbohydrates commonly found in the modern, processed diet. Essentialzymes-4 is a multi-spectrum enzyme complex specially formulated to aid the digestion of dietary fats, proteins, fiber, and carbohydrates commonly found in the modern, processed diet. Essentialzymes-4 combines both animal-based and plant-based enzymes into a single solution to help the body more completely break down problematic foods such as high fats and excessive starch. Essentialzymes-4 is a multi-spectrum enzyme complex specially formulated to aid the critically needed digestion of dietary fats, proteins, fiber, and carbohydrates commonly found in the modern processed diet. The dual time-release technology releases the animal and plant-based enzymes at separate times within the digestive tract, allowing for optimal absorption of key nutrients and amino acids. The plant-based enzymes capsule is designed to release immediately upon entering the stomach, where the pH environment is broad, acidic, and more conducive to plant based enzyme breakdown and proper absorption. The animal based enzyme capsule is formulated to delay its release in the lower intestine region, where the environment is more alkaline and the pH level is better suited for animal-based enzyme breakdown and proper absorption. 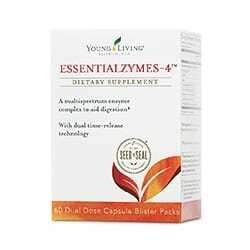 With Essentialzymes-4, Young Living has consolidated four products into one. These enzymes include optimal new delivery technology with much improved packaging & stability measures making them easier for daily use and transportability. Can I take Essentialzymes-4 without the capsules (opening the capsule)? Enzymes, in microscopic particle sizes/dry powders, can cause major health issues to the lungs, mucus membranes and other soft tissue internal areas of the body. It is highly recommended that consumers use this product as directed on the package and do not remove the enzyme powders from either capsule. What is the difference between Essentialzyme, Essentialzymes-4, Detoxzyme and Allerzyme?